For every 20 degrees that compressed air is cooled, the air loses 50% of its ability to hold moisture (humidity) in vapor form, which is then dropped out as a liquid. Air Drying and Air Filtration…. There is a Difference! Air dryers should be used when you want to remove or reduce the humidity levels in your compressed air system to meet manufacturer requirements for paint systems. Air Filtration – The removal of particulates, water, oil droplets, and oil aerosols. 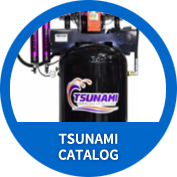 Our factory trained installation crew can get your new Tsunami Air System installed correctly and quickly.